The Oceanographic Museum is offering two dives totaling thirty minutes lenght. Dive with dolphins and whales without getting wet! No need for a mask, snorkel and fins to swim with orcas and dolphins. Only Althougha small virtual reality helmet is required. After the small explanation to the audience and they headed under water. 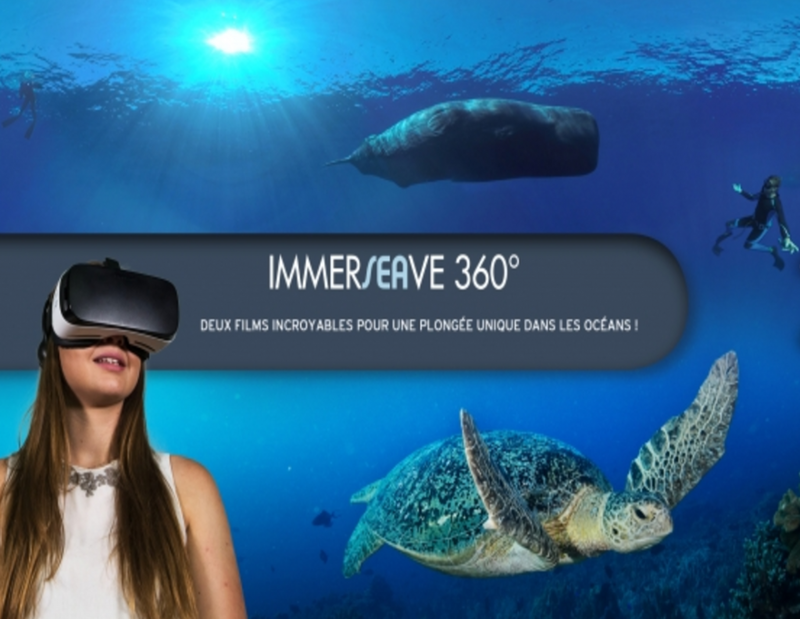 The new technology plunges through ocean waters to deliver a unique experience for summer visitors at the Oceanographic Museum of Monaco, until 3 September. A double dive with a total duration of thirty minutes in the waters of the Philippines, entitled ImmerSEAve360°. In addition to the photographic retrospective of the Tubbataha marine site, the Museum’s Conference Hall hosts this unique activity twice a day. Visiting whales, sperm whales, dolphins and some unexpected species is just magic. For the second year in a raw Oceanographic Museum has been using this technology to help public discover ecosystems around the world. A militant approach to the ecological cause which connects with causes defended by Prince Albert II, who also revived the tradition of great explorations in the world. The sovereign is also one of the few human beings present in the virtual animation at the Oceanographic Museum. Activity accessible without reservation, extra charge of 8 euros per person. Free for children under 12 years of age. Daily at 1:30pm and 2:30. I protect the oceans: Through a new basin, created in collaboration with the artist Philippe Pasqua, discover what all too often inhabits the oceans and coasts: waste! Every day at 3:30pm. The Tactile Pool: Touch a starfish, feel the prickles of a sea urchin, caress a Mediterranean baby shark. Supplement of 6 euros per child (3 to 12 years), 15 children max per session, online reservation or at the ticket booth. Every Saturday, Sunday, Tuesday and Thursday at noon. Every day at 1pm, 2pm, 3pm, 4pm, 5pm, 6pm. Feed the animals in the tactile pool: Supplement of 8 euros per child (4 to 12 years), 15 children max per session. Every Monday, Wednesday and Friday noon. “Tubbataha” Exhibition: 21 photographs of the Tubbataha Reef marine site (in “XXL” format). Until 31 August. Discover bioluminescent coral: Every day, animations at 12:00pm and 3pm. “Coral, heart of the ocean” film screening: Follow the expedition of Prince Albert II to the Tubbataha Reef Natural Park in the heart of the Sulu Sea, registered at Unesco World Heritage. Everyday. French version at 12:30pm and English version at 1:00pm. Feeding: In the company of an animator, help withfeeding one of the animal residents while discovering the habits and secrets of aquariologists! Every day at 5:15pm. Fish snacks: Do not miss the daily meal of lagoon residents: the sharks! Every day at 11:15 am. Sound and Light: Discover the skeletons of the fin whale, orca or narwhal as you have never seen them before. Every hour, from 10am to 7pm. ASM Mascot Bouba, the Tightroping Elephant!